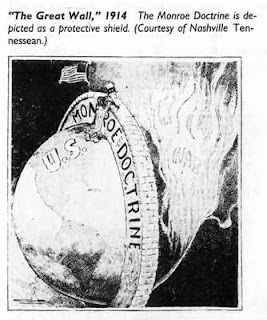 Earlier this week, Foreign Policy in Focus posted an interesting article arguing for the abandonment of the Monroe Doctrine policies. Brenner and Landau begin by chronicling the problematic history of "Monroeism" and then explore its different meanings in the United States and Latin America. President Barack Obama could swiftly improve U.S. relations with Latin America by announcing the death of the Monroe Doctrine and then presiding over its funeral. Such a statement would cost him little domestically, and win him praise and appreciation throughout Latin America and much of the world. Most Americans don't know the details of this 185-year-old policy and could care less about it. Latin Americans, in contrast, not only can describe the Monroe Doctrine, but they revile it. In effect, it has become nothing more than hollow rhetoric that offends the very people it purports to defend. Labels: indigenous issues, latin america, politics, U.S.
What Monroe Doctrine? The U.S. restructured every economy except Cuba's to open them to foreign investment from anywhere. And by the way, Obama is a capitalist tool.